For those in Home Education, we wanted to allow you to all get-together and jump @ AirJump. This is a trial to see if we launch a monthly club. We all need to exercise and why not have some fun while doing it. With prices reduced to £8 per person and just 50p for socks. 13th June is our first trial. Lets make this successful so we can run these regularly for all you home schooled children. Please contact richard@airjumptrampolinepark.co.uk to book and find out more. At present you are unable to book this session online. Do we pay on arrival for the Home Education session today please at 12.00?? While we are running trials for this session you are unable to book online and would need to pay on arrival. when is the next home ed session ? 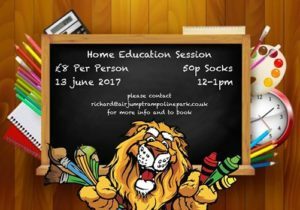 The next Home Education session is available on the 18th July. This will then be the last session until after the summer holidays. The next Home Education session begins on the 12th September and run every 2 weeks until the next school holiday in October.